Home > Articles > Federal Rule 1006 Summaries > What’s new in pain management? Demerol (Meperidine) was once commonly used for pain control, particularly after surgery to relieve moderate to severe pain. Demerol can be given orally, subcutaneously, intramuscularly or intravenously. It was often used in combination with Vistaril or Phenergan to enhance its effects. A common order is 75 mgs every 4 hours. This order is inadequate because Demerol provides pain reduction for only 2.5 – 3.5 hours. A dose of 75 mgs every 4 hours is equivalent to only 5 – 7.5 mgs of Morphine. To obtain the same amount of relief as that provided by 10 mgs of Morphine, physicians would need to prescribe 100-150 mgs of Demerol every 3 hours. 1 Demerol should not be used when kidney function is impaired, as it is excreted by the kidneys. Seizures, increased intracranial pressure, respiratory depression, confusion, and irritability may result from its use. The frequency with which prescribers have requested that Demerol be given to patients has substantially declined in recent years. It is no longer the pain reliever of choice, although it may be used to reduce shivering in a postoperative patient. In addition to Methadone, which has an extended effect with a half life of 24 – 48 hours, other new medications are effective for once-a-day dosing. New extended release products on the market include Hydromorph Contin, a 12 hour extended release form of Dilaudid/hydromorphone. Kadian and Avinza are two forms of extended release morphine, and may be used for 24 hour dosing. 2 Both Fentanyl and Lidocaine can be delivered by patch. The Fentanyl patches take up to 48 hours to reach full effect and are changed every 72 hours. Lidocaine patches are applied over the painful area for 12 hours a day. Concerns have been identified in the last few years about the hazards of PCA by proxy, that is allowing nurses and family members to activate the PCA pump on behalf of the patient. Overdoses of medication have occurred due to this practice, which is now being discouraged. Careful PCA pump programming and patient selection, as well as vigilant monitoring for the patient’s responses to medication are essential to provide a safe delivery of pain relief. There have been tragic instances of overdoses delivered through PCA pumps, resulting in respiratory arrest and brain damage. A PCEA (patient controlled epidural analgesia) pump is one that delivers pain medication into the patient’s epidural space. 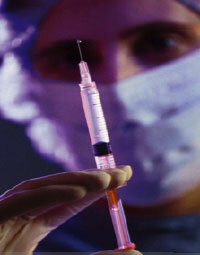 Dilaudid, Morphine, or Fentanyl are used along with a local anesthetic such as Buprivacaine or Ropivacaine. The epidural method of pain medication administration should be done only by clinicians who are skilled in its use and when careful monitoring of the patient can be provided. Joint Commission on Accreditation of Healthcare Organizations standards place emphasis on ongoing recording of pain levels using a scale that is appropriate to the developmental stage and communication abilities of the patient. Increasingly, medical records contain this information. Using data in the medical record, methods of conveying pain to a fact finder include: presenting a sample of words used by the patient to describe pain (sharp, excruciating, constant, shooting), creating a calendar using symbols for each dose of pain medication given in the acute care setting, and using candy such as M&Ms to represent each dose of pain medication. 1. Agency for Healthcare Policy and Research, Acute Pain Management: Operative or Medical Procedures and Trauma, US Department of Health and Human Services, Rockville, MD, 1992. 2. D’Arcy, Y. “Conquering pain: Have you tried these new techniques?” Nursing 2005, pgs 36-41, March 2005. Contact us for information about medical record summaries that provide details about pain symptoms and management, as well as timelines, chronologies, and other aids to understanding treatment.